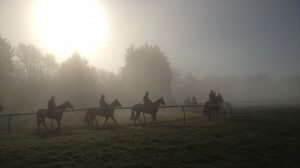 After those gloomy and wet, but never cold, months since the autumn equinox, it was great, on the first morning when daylight exceeds darkness, to be on the gallops. For me, somewhat surprisingly, it was on the Limekilns at Newmarket, rather than a great estate in Wiltshire, where my first chance to get wet shoes occurred. We walked across from the car park into the centre of the beautiful expanse of grass, and saw some nice horses work up the Short gallop. Our (Raymond Tooth’s) boy, an unraced three-year-old homebred just that day officially the recipient of the name Scion – I say Sky-on, you say Si-on – had his first go on the turf. It wasn’t work; that was the task for the groups of two who preceded his trio over the seven and a half furlong route, but a nice canter gave him enough to think about. The way he kept going, even seeming to resist his rider’s call to ease off at the end, suggested something might be in there. You know when a work rider, especially as in this case one who’d never ridden the horse before, comes off grinning, that there’s a glimmer of hope for the future. His name, meaning a descendant of a noble line, might look prophetic, as his sire Dutch Art has been upwardly mobile ever since entering stud at Cheveley Park. As I waited for Lady Cecil and assistant George Scott to arrive at the car park – soon to be joined by Teddy Grimthorpe, there to watch some of the Abdullah team – a number of trainers and Cheveley Park’s John Marsh waved on their way to the Al Bahathri Polytrack gallop. Walking over, you could only describe the ground as perfect, echoing the assessment by local clerk of the course Michael Prosser over at the Rowley Mile. The surprise was that more trainers were not utilising the grass on one of the days when the balance of moisture – it rained a fair bit overnight – made the ground safe on all counts. As one horse made his first big step towards his designated role, another of Raymond’s real champions was settling in after a fabulous career 170 miles across country in Shropshire. The Kinsale stud, run by Richard and Rachael (nee Sinden) Kempster houses the boss’s mares, so that’s where Scion started his life. When he failed the vet after being sold to Rae Guest for 38,000gns as a yearling, he returned to the stud and was looked after until it was time for a wind op to be undertaken by famed vet Geoff Lane, who had been the expert who diagnosed the defect at the sale. That operation looks to have gone well – touch wood – as there was no hint of a sound at the canter, but they often can recur. Geoff also dealt with the horse I’d referred to earlier, but while he was sound enough to run a good first race at the age of 10 for David Pipe, the old legs showed more sign of wear and he was finally retired just before Cheltenham. So we come back to Richard and Rachael and can declare a rare family subterfuge. Once we knew time was up for the old horse, Raymond suggested giving him to the Kempsters and I passed the idea on to Richard when I saw him in Newmarket where he was bringing the mare Lawyers Choice to visit Mayson at Cheveley Park. The plan was instantly agreed and it was not until a few days before the transfer that Richard confessed he’d not told Rachael of the imminent arrival. I played along, and fortuitously Rachael and the two young children were away for the day when the great Punjabi rolled into the yard. Later that day they returned, and she was walking down the yard – husband nowhere to be seen – when she noticed the new horse. He had said “something out of training was coming” for a rest, and being a pretty poor liar, was less than convincing. Half a minute later it registered who the newcomer was and it was so emotional for her as Rachael had worked for Raymond’s late trainer daughter Julia Tooth when she had her stables in Warwickshire. She had been with Julia at his two greatest days at Cheltenham and Punchestown for his Champion Hurdle wins. I don’t do Postbook or Twotter, but she does, and news of the arrival has already spread so that by the weekend several visits were arranged and Sara, Nicky Henderson’s travelling head lad, was also planning to pop in to see her old friend. (I’m going on Wednesday). At least three riders and one leader-around-the-ring (Sara) have already staked their claim when as Rachael plans, he joins Denman, Kauto Star and the similarly newly-retired Big Buck’s in the parade ring at the 2015 Cheltenham Festival. Raymond has gradually embarked on a new path, concentrating on breeding to race rather than join in the ever-escalating cost of buying expensive yearlings. In the same year that Scion went to the sale, another Dutch Art colt, now named Dutch Art Dealer was sold and then re-submitted at the Breeze-Ups last year. He had three runs as a juvenile for Paul Cole, starting favourite when third to the highly-talented but ultimately ill-fated Piping Rock at Ascot; winning well at Windsor and then finishing a very unlucky third on handicap debut at Lingfield. We’re hoping he’ll do well for owner Richard Green as Ray has his very nice full-brother with Hughie Morrison. Their dam is Lawyers Choice. Again it’s a case of completing the circle, for when she went to Dutch Art he stood for 5,000gns. By the time Ray’s very fast sprinter Catfish visited him last year - she had a nice filly first foal last week, too – his fee had gone to 18,000gns and now it has soared to 35,000gns! Mayson, like Dutch Art was a top sprinter, five-length winner of the July Cup and afterwards a brilliant second in the Prix de l’Abbaye over an inadequate five furlongs. He boasts a top pedigree, being the highest-rated son of Invincible Spirit from a mare by Cheveley’s greatest (still active and too expensive for us) stallion Pivotal. As with Dutch Art in his early days, he’s modestly-priced (6,000gns) but the foals that have appeared so far from his first crop have impressed and he’s going to get around 100 or so, I’m told. Maybe I forgot the most compelling reason for me to try to talk Ray into it – he raced in my old colours. When David Armstrong acquired them at the Weatherbys cherished colours sale, I told him they were lucky. Sometimes I reckon the football team on whose livery they were based have long outlived the ancient cry “Lucky Arsenal”, just like the crowd refrain “same old Arsenal, always cheating” is ridiculously unfair. One thing I promised myself as Alex (“it was me”) Oxlaid-Chamberlain was kept on the pitch (but effectively neutered) as Kieren Gibbs was sent off at 1 p.m. yesterday is that I’ll never get BT Sport. First it was Manchester City, then Liverpool and Chelsea. In three Michael Owen games, they’ve conceded 17 goals. In the whole of last season they let in 14 in the entire 19 matches. That’s some Saturday morning syndrome!